I've always admired Jennifer Lopez because she is of course, beautiful but my "admiration" ends there. I've hardly ever heard of her supporting the poor community she hails from, Hispanic people in general or any of its causes and she undoubtly has both the money and platform to do so. A couple of days ago, I saw some recent pictures of her and had to ask my best friend and also my cousin if they thought that it was Jlo's make-up that made her facial features looks so different and more Caucasoid or did she have more work done. I think she's done more plastic surgery, which really just makes me dislike her even more. Read the article below and post what you think? Bronx born singer/actress/dancer Jennifer Lopez, a “Nuyorican,” has been banned from the nation’s largest chain of Latin music stores. Ritmo Latino banned all J.Lo CDs from its 50 stores, charging that J. Lo has forgotten her Puerto Rican roots. Ritmo President David Massry alleged that J.Lo “has refused personally to promote her new CD in any of our stores” and won’t appear at other outlets devoted only to Latin music.“We’ve supported her from the beginning. Now we’re told by her record company she will only visit Anglo retail outlets,” Massry said. On Wednesday, J.Lo signed hundreds of autographs at the F.Y.E. record store in her home borough for fans who bought her new disc, “Como Ama una Mujer” (”How a Woman Loves”), Lopez’s first album sung only in Spanish. “This is a Spanish-language CD, and if she wants to discriminate against the Latin community, then we will not sell her product,” Massry said. Free Poem: every day, for 30 days! Nine years ago we began a Knopf tradition. To celebrate National Poetry Month,we sent a poem a day by e-mail for 30 days to anyone who asked to receive them. Now, with over 25,000 subscribers, we are proud to continue with a whole new series of daily poems. Each day during the month of April you will receive a poem from some of the best poets in the world including Mark Strand, Sharon Olds, and Laurie Sheck, as well as classics from Langston Hughes, Robert Burns and more. This year, we'll also be featuring audio clips from The Knopf National Poetry Month Collection, special printable broadsides, signed books and more. visit http://www.randomhouse.com/knopf/poetry/poemaday/ to sign up. Maybe it's the Spring weather, that making me reminisce, but I heard this song on Pandora a little while ago and was just "whoa, now that's throwback!" Enjoy! by the touch of you and I.
like reparation to a dying man. * Inspired & dedicated to W.
Free Hispanic Magazine for Literanista Readers! HISPANIC Magazine is the leading lifestyle publication for the Hispanic household. Through interviews, reviews, and features on current events, lifestyle, entertainment, business and politics, readers get first-class content along with an intelligent and informative perspective on issues of relevance to the Hispanic community. With a unique, worldly and cutting-edge approach, HISPANIC delivers insightful and compelling information to help our readers become leaders, professionals, and innovators. Only through this offer can you get HISPANIC Magazine totally FREE, and save $35.00 off the regular newsstand price. To guarantee receiving your subscription for free please subscribe online now. Don't wait; this is an exclusive, limited time offer. They're All Descendants of Spanish Origins! Britain and Ireland are so thoroughly divided in their histories that there is no single word to refer to the inhabitants of both islands. Historians teach that they are mostly descended from different peoples: the Irish from the Celts and the English from the Anglo-Saxons who invaded from northern Europe and drove the Celts to the country's western and northern fringes. But geneticists who have tested DNA throughout the British Isles are edging toward a different conclusion. Many are struck by the overall genetic similarities, leading some to claim that both Britain and Ireland have been inhabited for thousands of years by a single people that have remained in the majority, with only minor additions from later invaders like Celts, Romans, Angles, Saxons, Vikings and Normans. The implication that the Irish, English, Scottish and Welsh have a great deal in common with each other, at least from the geneticist's point of view, seems likely to please no one. The genetic evidence is still under development, however, and because only very rough dates can be derived from it, it is hard to weave evidence from DNA, archaeology, history and linguistics into a coherent picture of British and Irish origins. That has not stopped the attempt. Stephen Oppenheimer, a medical geneticist at the University of Oxford, says the historians' account is wrong in almost every detail. In Dr. Oppenheimer's reconstruction of events, the principal ancestors of today's British and Irish populations arrived from Spain about 16,000 years ago, speaking a language related to Basque. This new population, who lived by hunting and gathering, survived a sharp cold spell called the Younger Dryas that lasted from 12,300 to 11,000 years ago. Much later, some 6,000 years ago, agriculture finally reached the British Isles from its birthplace in the Near East. Agriculture may have been introduced by people speaking Celtic, in Dr. Oppenheimer's view. Although the Celtic immigrants may have been few in number, they spread their farming techniques and their language throughout Ireland and the western coast of Britain. Later immigrants arrived from northern Europe had more influence on the eastern and southern coasts. They too spread their language, a branch of German, but these invaders' numbers were also small compared with the local population. In all, about three-quarters of the ancestors of today's British and Irish populations arrived between 15,000 and 7,500 years ago, when rising sea levels split Britain and Ireland from the Continent and from each other, Dr. Oppenheimer calculates in a new book, ''The Origins of the British: A Genetic Detective Story'' (Carroll & Graf, 2006). Other geneticists say Dr. Oppenheimer's reconstruction is plausible, though some disagree with details. Several said genetic methods did not give precise enough dates to be confident of certain aspects, like when the first settlers arrived. ''Once you have an established population, it is quite difficult to change it very radically,'' said Daniel G. Bradley, a geneticist at Trinity College, Dublin. But he said he was ''quite agnostic'' as to whether the original population became established in Britain and Ireland immediately after the glaciers retreated 16,000 years ago, as Dr. Oppenheimer argues, or more recently, in the Neolithic Age, which began 10,000 years ago. Dr. Oppenheimer's population history of the British Isles relies not only on genetic data but also on the dating of language changes by methods developed by geneticists. These are not generally accepted by historical linguists, who long ago developed but largely rejected a dating method known as glottochronology. Geneticists have recently plunged into the field, arguing that linguists have been too pessimistic and that advanced statistical methods developed for dating genes can also be applied to languages. Dr. Oppenheimer has relied on work by Peter Forster, a geneticist at Anglia Ruskin University, to argue that Celtic is a much more ancient language than supposed, and that Celtic speakers could have brought knowledge of agriculture to Ireland, where it first appeared. He also adopts Dr. Forster's argument, based on a statistical analysis of vocabulary, that English is an ancient, fourth branch of the Germanic language tree, and was spoken in England before the Roman invasion. Germanic is usually assumed to have split into three branches: West Germanic, which includes German and Dutch; East Germanic, the language of the Goths and Vandals; and North Germanic, consisting of the Scandinavian languages. Dr. Forster's analysis shows English is not an offshoot of West Germanic, as usually assumed, but is a branch independent of the other three, which also implies a greater antiquity. Germanic split into its four branches some 2,000 to 6,000 years ago, Dr. Forster estimates. Historians have usually assumed that Celtic was spoken throughout Britain when the Romans arrived. But Dr. Oppenheimer argues that the absence of Celtic place names in England -- words for places are particularly durable -- makes this unlikely. If the people of the British Isles hold most of their genetic heritage in common, with their differences consisting only of a regional flavoring of Celtic in the west and of northern European in the east, might that perception draw them together? Geneticists see little prospect that their findings will reduce cultural and political differences. The Celtic cultural myth ''is very entrenched and has a lot to do with the Scottish, Welsh and Irish identity; their main identifying feature is that they are not English,'' said Dr. Sykes, an Englishman who has traced his Y chromosome and surname to an ancestor who lived in the village of Flockton in Yorkshire in 1286. Dr. Oppenheimer said genes ''have no bearing on cultural history.'' There is no significant genetic difference between the people of Northern Ireland, yet they have been fighting with each other for 400 years, he said. Can video save the literary star? Ask the tastemakers at Powell’s Books, the venerable independent bookstore in Portland, Ore., who are planning a new series of short films featuring authors, to be shown at bookstores, movie-premiere style. The British author Ian McEwan is the star of the first film, which is planned to run 23 minutes and will feature snippets from an on-camera interview with Mr. McEwan, as well as commentary from peers, fans and critics. For Mr. McEwan, the film will virtually replace his standard book tour, since he has declined to do traditional bookstore appearances to promote his new novel in the United States. The book, “On Chesil Beach,” will be published on June 5 by the Nan A. Talese imprint of Random House’s Doubleday division. For years publishers and bookstores have tried to lure book buyers by featuring authors in blogs, podcasts and question-and-answer forums with readers. Mr. Weich said Powell’s did not expect to profit from the first film but hoped to attract more visitors to its Web site, powells.com, by posting the videos there. Powell’s has enlisted Doug Biro, a former creative director at RCA Records, to direct the first film. (Mr. Biro has also directed music videos for Christina Aguilera and Rufus Wainwright.) It will have its debut on June 1 in Manhattan during BookExpo America, a widely attended annual gathering of publishers, booksellers and authors. More than 50 bookstores across the country have planned screenings of the film from June 13 to 17. After it is shown, the video will be posted on Powell’s Web site and as a series of shorts on YouTube. I was listening to this song, this morning on my way in to work and it put me in such great spirits. Just making the most of life"
At least that's what Mami always told me. It's funny but back then I hated soup, not that I was a picky eater because I wasn't but there were certain things I didn't like. Broth was okay, but not small veggies or noodles, (so when I was sick my mom strained her soups for me) I was the same way with beans too, I ate the beans, potatos and sauce but picked out any visible trace of anything else my mom added to them. As an adult now, my tastes have changed as do most people's, I actually love thick soups now but still have an aversion to veggies, yet if they happen to be in my soups or beans or any sauce, I will eat them... and even enjoy the flavor! LOL! Anyway, this morning I woke up to a pounding headache so I ordered crab & asparagus bisque for lunch today. I was surprised to find it was green, so apropo for St. Patty's Day tomorrow. It cheered me up a bit, especially now that it's like basically an ice storm out. And, I have a million things to do...my eyebrows, my hair, a mani & pedi...the list just goes on and on! A new book is out by Columbian writer, Laura Restrepo. Delirium: A Novel by Laura Restrepo and Natasha Wimmer, it's about the life of a struggling literature professor who must investigate what has caused his wife to go insane. The 2007 International Latino Book Awards will be held on Thursday afternoon, May 31, at 4:30 in Room IE10 at the Javits Center in New York City. Nominations close this Friday (March 16). At this point the safest way to make sure your entry is received in time is to fax the forms to us directly at 760-434-7476, and then mail the original forms, payment and copies of the nominated titles. You will be entered if they receive your faxed forms by March 16. Your payment, original forms and 5 copies of the nominated title have to be in the Carlsbad offices by March 27th. Not the fruit nor the hot dog place, but a very cool paper goods spot, check it out! - Why do obese people always choose to sit next to little ole me? And, then invade my personal space? So this is what happened this morning, the bus I got on wasn't that full, I mean they were plenty of empty seats scattered about. When I got on I went all the way to back row and sat by the window, the last lady who got on decides she too is going to sit in the back row. Now the back row offers 5 seats, instead of choosing the middle seat she sits next to me but takes up the two seats next to me. There were two other seats next to her, I don't understand why she had to sit so close to me. Then to top it off this freaking fat lady takes out some heavy, heady nauseating lotion and proceeds to glob herself up. I was so outraged but I just tried to close my eyes and sleep but seriously WTF? To top off my disgust at humanity today I'm bored, and my work isn't thrilling me today but then does it ever? I've Fallen in Love...with A Dress! So this Friday, I've plan to attend a wedding, yes on St. Patrick's Day and no, they're not Irish! I was quite worried about what to wear because my boyfriend is the best man and he will be in a tux and not only that but I think at one point the groom's sister was interested in my man so I knew I had to look wickedly fierce either way. Isn't it beautiful, I'm in love with it. I can't wait, I'm gonna get my hair done and a pedicure. It's so funny, I swear i've "visited" that dress' link over 20xs at least since last Friday. I can't wait to put it all together. Jessica Gonzalez, Literanista Stands With You!!! Domestic Violence Victim Goes Before International Human Rights Commission to Sue U.S. In a history-making human rights challenge against the United States, Jessica Gonzales, spoke out publicly last week in front of the Inter-American Commission on Human Rights. 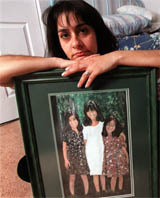 Gonzales lost her three daughters after they were kidnapped by her estranged husband, and later killed in his standoff with Colorado police. these orders are meaningless. We need to hold the U.S. government accountable." police failed to enforce a restraining order against her estranged husband. discovered the bodies of the three girls in the back of his pickup truck. "In domestic violence cases such as Jessica’s, international bodies provide access to redress when the home country fails to act," said Steven Watt, an attorney with the ACLU Human Rights Program. Gonzales filed a lawsuit against the police, but in June 2005, the U.S. Supreme Court found that she had no constitutional right to police enforcement of her restraining order. Last night, this phrase just kept playing itself over and over in my head like a broken record. Homie Don't Play That! So here's a throwback to In Living Color, and the infamous words of one Homie Da Clown... * Yeah, I know it's not PC, but it's just comedy, people. You know maybe it's the Sicilian blood in me, perhaps the Puerto Rican or maybe I was endowed with a fierce (read: deadly) combination of both. I hate to perpetuate stereotypes, but in this case - it's true. Mammajamma has a bad f'ng temper, the weird thing is that most of the time I'm so docile, passive, and sweet but certain things make my blood boil. Which makes me think of the maxim "blowing a gasket," I tried to google its origin but had no luck, but itsn't it so delightfully visual, that expression? Well, I have to be careful that I don't ever get hypertension, I mean being Hispanic, what are the chances right? LOL! Anyway, sometimes I get so angry, I literally shake or see red, or get a pounding headache. Literally! Not good! I really need to get back into yoga, and let no man tear me asunder from my peace. My talented older sis, who's a NYC teacher in an elementary school, tells me that she tells her students to "save the drama, for their mamma!" Love it! like seriously, take that sh*t elsewhere, it's not welcome here! Gabriel Garcia Marquez celebrated his 80th birthday yesterday and "told friends that he has begun writing his second volume of memoirs"--a happy contrast to his statement last year that he had "run out of gas" for writing. The report comes not from Marquez himself, but friend and collaborator Plinio Apuleyo Mendoza. HarperCollins has released a “Browse Inside” widget that simply opens the Browse Inside feature in a new window (example), while the Random House widget is a bit more advanced: it lets you browse the pages of the book in the widget itself, and even pop out a large window so you can actually read the book as a slideshow. Even better: they’ve provided an option to copy the widget without leaving the page you’re on, and a “buy” link to buy the book on the publisher’s site. There’s also a book search to find other Random House books. Rupert Murdoch may own HarperCollins and MySpace, but RandomHouse is outshining them when it comes to widgets.